It seems that a bunch of anti-abortion folks are suing an abortion rights group for posting online private, confidential contact information of anti-abortion advocates who protest or offer abortion alternatives at local abortion clinics. Yep, I’m not making this up. An attorney named Steven Tiedemann has filed three suits in Federal and State Court against “Voice of Choice,” its founder Todd Stave and its current director Wendy Robinson. Attorney Tiedemann represents anti-abortion people who allegedly have been “injured” by VOC’s “Bully List,” which lists abortion clinic protestors, complete with their photo, their personal address, email address and phone numbers. Can you believe this crap? I mean, let’s go back in time for a second here. Remember in the 1990’s when a guy named Neal Horsley created something called the “Nuremberg Files,” which was a compilation of names, pictures, etc. of abortion doctors, clinic staff and other pro-choice leaders? Some called it a “hit list” and, indeed, whenever a doctor on the list was murdered, Horsley put a red “x” through that doctor’s picture. Nice, huh? Remember years ago when anti-abortion activists would stand outside the clinics and write down the license plates of the doctors, staff and even the patients and, armed with that information, went down to the local Department of Motor Vehicles and legally retrieved the home addresses of those parties? 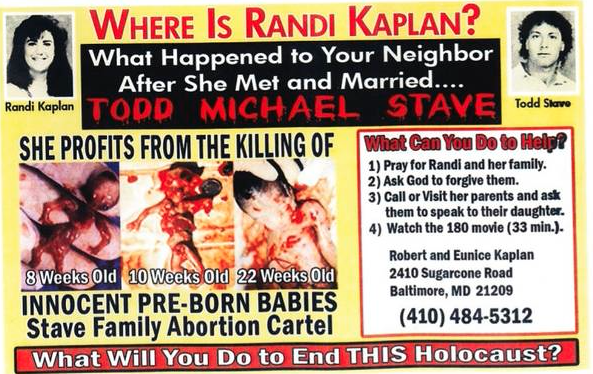 Then, that information was put on flyers, copied a few thousand times and distributed throughout the anti-abortion network in that town. A short while later, staff and patients received death threats at their very home or, worse, the protestors wound up on their front yard. And in the case of Todd Stave, one of the defendants in the suit, the antis actually picketed the school that his daughter attended and the office of Stave’s landlord. So, now Stave is fighting back and the antis are whining about it. The lawsuit alleges that “the clear purpose of VOC is to mount a harassing calling/email campaign against those listed as ‘Bullies.’” The suits allege that VOC, Robinson and Stave encourage and provide instructions to their followers to call and email anti-abortion protesters repeatedly in order to halt the anti-abortion protests. Geez, I wonder where Todd learned how to do this? OMG, this is rich! Can’t take their own medicine. Poor babies. They just hate it when you use their tactics. I don’t think consistency is in their vocabulary. I think that’s why they support oppression and violence in the name of equality and love. Either that or they have a very misguided sense of irony. So, I’d suggest we look up Steven Tiedermann and start a writing campaign, individually. Is he going to sue thousands of us? Hey! I put in the address as well, but it’s missing from the post! What gives? VoC sounds like a wonderful org. Always amazing. In case you are interested…some of us remain on the “target list” – including me by my former name! The site is still up on its own as well as part of scholarly studies. Hey, I’m there too! Awesome. the purpose isn't to halt protests, it is to stop abusive behavior by aggressive protesters. there is quite a difference there. Damn I even provided a name they should add to the bully list. I even sent friend requests to the ones that have FB pages, none of them so far have accepted my friend requests..LOL Perhaps Todd could counter sue the “bullies” ? Please do not add addresses or personal contact info in the comment section. We do appreciate your comments so very much . . .
Why don’t the anti abortion protestors understand that they are harming women? Taylr: They are so focused on abortion, they can’t care for human life. That is why their adoption rates are no greater than– and somewhat lower than– the rest of the population. They are driven to be heroes– none of us wants to die, and we all have ways of dealing with the knowledge of our certain death– religion, philosophy, etc. However, their way of dealing with it is to become a hero: If they pay the price society specifies, they will live in immortality, like all the heroes we remember from ages past. However, rather than meet society’s price, they try to sell society a new definition of heroism: fighting for fetuses. Hence, the language they use to call the fetus an “unborn human,” etc., and to portray themselves as “respecters,” “defenders,” “champions,” etc. If they win the PR campaign, then they will assure themselves that yes, they will transcend death. They CAN’T care about the harm they do to women! It would impede their need to “save” themselves from the most horrible fate they can imagine– being nothing. They wage an allegorical battle in which abortion represents Death, the fetus represents themselves, and they represent God. local Edinburgh courier insurance couriers would not have fought. you need to use yours.